We are family of two adults with 3 children. We stayed at the hotel for a week. The owners are very hospitable and friendly. The kitchenette was equipped (but without microwave) The place is very quiet. Beautiful view from the terrace. Recommended! We Had a wonderful time at Bella Vista, the view on the sea is simply breathtaking, waking up with that kind of view was truly great! Michele and all the staff were super available and always kind, every particular request we had was satisfied promptly. If you are looking for a quiet beautiful place in Rhodes I absolutely suggest Bella Vista! Fabulous location, lovely staff, good value for money. It's a family-run business with very kind people. Location is superb with providing a nice view over Stegna beach, which you'll have to pay for by climbing a steep road - just to be aware if you don't plan to rent a car or scooter. The host offers airport shuttles and rental services for cars and scooters. Breakfast was more than excellent. Hope to be back again. Hotel staff extremely friendly. We did get lost in town and Mike jumped on his scooter and picked us up in 2 minutes when we called! Best healthy breakfast of our trip. Perfect room and the only shower of our trip in Europe that did not leak! A beautiful location, overlooking the bay of Stegna. The owners were very friendly and couldn't have been more helpful. 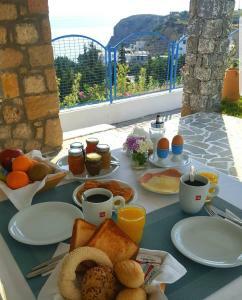 Delicious, healthy Greek breakfast and spotlessly clean rooms. Location is pretty good. It is quiet but close to the beach and restaurants. Parking spot provided by hotel. This is a wonderful hotel ,very cosy ,well located ,quite area ,really fantastic breakfast home made.The owner are friendly ,they like their job and you feel it. I am a travel agent and I can confirm that this hotel is really very good; far from the noisy beaches of Faliraki. Lock in a great price for Bella Vista Stegna – rated 9.3 by recent guests! Surrounded by a lovely garden, Bella Vista studios are air conditioned and equipped with TV, safe, hairdryer and fridge. Stegna Beach is organized and features sun loungers and umbrellas. Restaurants, shops and bars are nearby. It is located in the central part of the island 19 mi from Rhodes Town, 22 mi from the Airport and 12 mi from Lindos. When would you like to stay at Bella Vista Stegna? This spacious studio offers a balcony with unlimited sea views and the lush garden. This spacious apartment has 2 separate bedrooms and offers a balcony with unlimited sea views and views of the lush garden. This spacious studio offers a balcony with unlimited views of the sea and the lush garden. This spacious suite offers a balcony with unlimited views of the sea and the lush garden. BELLA VISTA Studios is Located at Stegna Beach in Archangelos, Rhodes Island, Greece. Stegna Beach is located in the central part of the Island 30 km from Rhodes Town, 35 km From the Airport and 20 km from Lindos. BELLA VISTA is built on the right topside of “Stegna beach” offering the best view of this fantastic place. BELLA VISTA offers seaside accommodation plus beds and umbrellas in the sand and pebble beach for relaxing moments, and we are also fully organized for water sports. If quietness, family atmosphere and economical vacation is what you are looking for, then BELLA VISTA is the ideal solution for your accommodation in Rhodes. You can arrive to Rhodes Island by air or by sea. The flights depart from the “Eleftherios Venizelos” International Airport (Athens). The flights are direct from Athens to Rhodes and lasts about 45 minutes. Daily flights from Athens to Rhodes are available all year around. House Rules Bella Vista Stegna takes special requests – add in the next step! All children from 2 to 12 year are charged 20 % of the room stay per night when using existing beds. Bella Vista Stegna accepts these cards and reserves the right to temporarily hold an amount prior to arrival. Please inform Bella Vista Stegna of your expected arrival time in advance. You can use the Special Requests box when booking, or contact the property directly using the contact details in your confirmation. Everything was really good! If only small remarks for further improvements or to other tourists to pay attention: 1. No cutting board, salt in kitchen stuff. 2. Rather loud air conditioner (but maybe it is just a matter of habit). Our vacation was just amazing. 2 weeks in a comfortable apartments with friendly people around. The owners are very polite, kind and cheerful family. 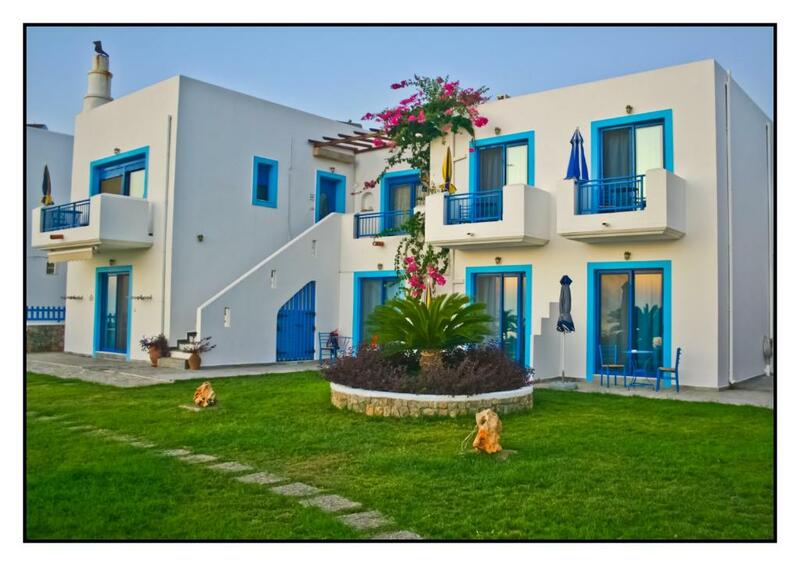 Bella Vista apartments looks like a Greek house I hoped to see: white walls with blue doors and windows and bouganvillea trees.😍 ✅Room service is performed every day except for Sunday. ✅There is a mini bar in the room. And two bottles of water and some of Greek sweets are offered as a welcome. ✅wi-fi ✅It seems that all rooms have a spectacular sea view. ✅Bella Vista is located rather high on the hill. It is not a problem to walk down to the beach but it requires efforst to climb back especially if you have bought some food. We rented a car as we planned to explore the whole island so it was not difficult for us to get back to Bella Vista from anywhere. ✅ We didn't hear any neighbours if the balcony door was closed. ✅There are quite a lot of places to eat next to Stegna beach. And 3 small shops where you can find almost everything you need (they work 7 days a week from 7 a.m. till 23 p.m). If you rent a car it is better to drive to Lidl (Sunday is a day off). Everything was perfect, nothing negative to add. Being out of season, there was rarely anybody about. So I saw the owner 2 in the 10 days i was there. Only saw cleaners daily. We booked studio with sea view for 3 people. The owner gave us the room with nice see view for one day and said that this room is more expensive then we had paid for. Next day he moved us to the room on the first floor with "wall view" and lots of ants (on foto). When we complained about ants they gave us Raid. So probably we had to deal with ants on our own. The staff and the service was terrible Very rude and not pleasant. The freezer didn't cool! The shower was tiny! And the electricity don't work with out the key!